The End of the World is a mere 1.68 billion years away. Howard Bloom, author of four books including, The God Problem: How a Godless Cosmos Creates today announced that the date for the end of the world is a mere 1.68 billion years away. December 21st the universe will end—that’s the prediction some have extracted from the Mayan calendar. Scientists counter that the universe has roughly 100 trillion years to go. But Bloom’s new theory of the universe, the Big Bagel, says that the Mayan cultists may have better guess than conventional cosmologists. (See Big Bagel animation on YouTube). 2) why there is so much normal matter in this universe and so little anti-matter (the parity problem). Big Bagel Theory is more formally known as The Bloom Toroidal Model of the Cosmos. It says the universe is a space-time manifold in the shape of what topologists call a “torus,” a doughnut, a bagel with an infinitesimally small hole. At the instant of the big bang, a matter universe spurts from the topside of the bagel’s hole and an antimatter universe spurts from the hole’s bottom. The two universes expand with enormous rapidity as they slide up and down the steep slopes leading from the hole. Then the universes slow as they reach the gentle horizontal surfaces of the bagel’s upper and lower bulge. Finally, the two universes pick up speed as they slide down the bagel’s outer slope. What makes the matter on the bagel’s top and the anti-universe on the bagel’s bottom speed up? Gravity. Specifically, the gravitational attraction between the two universes. New data from an analysis of the light from 48,640 quasars supports “The Big Bagel.” So do dozens of other studies. The new evidence comes from a team of 63 astrophysicists from nine nations led by Nicolas G. Busca of the Université Paris Diderot and the Observatoire de Paris participating in the Baryon Oscillation Spectroscopic Survey, or BOSS. The BOSS team has determined that roughly three billion years after the Big Bang “one sees the pattern of deceleration followed by acceleration” that Big Bagel Theory predicts. Previous studies have shown that the acceleration predicted by Big Bagel Theory shows itself at the 7.7 billion year mark after the big bang. But acceleration takes energy. Where does the energy behind the speed-up come from? Cosmologists say it comes from Dark Energy. And no one in cosmology and theoretical physics knows what Dark Energy is or why it exists. Big Bagel theory, on the other hand, says Dark Energy is simple. It’s gravity. 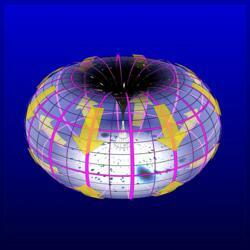 But the Bloom Toroidal Model does something better. It explains that acceleration’s very source. It explains Dark Energy’s gravitational secret–a matter universe on the top and an anti-matter universe on the bottom of a bagel. The study: N.G. Busca et al. Baryon Acoustic Oscillations in the Ly-α forest of BOSS quasars. arXiv:1211.2616. Posted November 12, 2012. Howard Bloom has been called “the Darwin, Einstein, Newton, and Freud of the 21st Century” by Britain’s Channel4 TV and “the next Stephen Hawking” by Gear Magazine.